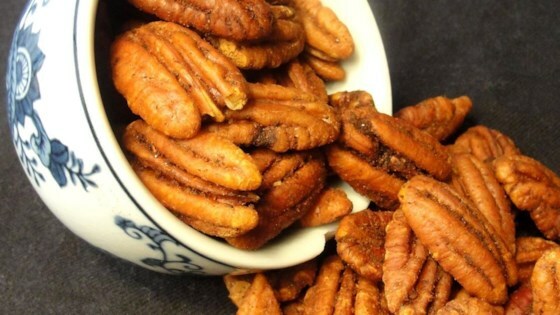 "These pecans aren't too hot, but you can leave out the red pepper if you like them milder, or increase it to taste. These make a great snack or appetizer for the holidays, or anytime." In a medium bowl, mix butter, Worcestershire sauce, red pepper, salt, and garlic powder. Stir in the pecans, and gently toss with chili powder to coat. Spread coated pecans on a medium baking sheet, and cook 30 minutes in the preheated oven, stirring approximately every 10 minutes. Very good! I use these on top of green salads. Mine were ready in only 20 minutes though, possibly because I used a very dark baking sheet. Yum! Have made these several times, and were wonderful each time. I like them a little spicy, so make them just as the recipe says. Very good - even better with 1 tsp soy sauce in place of salt, and cayenne instead of red pepper. Very good. I spiced it up even more. Men seem to really like these. I increased the red pepper and made it with whole almonds instead of pecans. Big hit! !